Dieterle, Paris. Paul Gerson, New York. Harold Sidney Harmsworth, 1st Viscount Rothermere [d.1940]; (his sale, Christie's, London, 19 December 1941, no. 34); purchased by (Arthur Tooth and Sons, London and Paris) for Capt. Edward H. Molyneux [1891-1974], Paris, by 1952; sold 15 August 1955 to Ailsa Mellon Bruce [1901-1969], New York; bequest 1970 to NGA. According to annotated copy of the sales catalogue in NGA curatorial files. 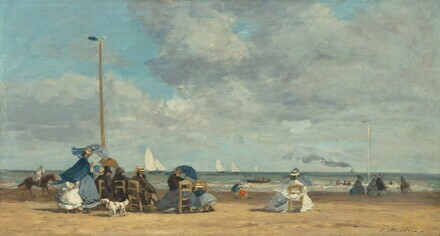 This is almost certainly the picture recorded as Boudin, "At Deauville" in Arthur Tooth records, volume XXI, London Branch Stock Inventory, p. 85 (Getty Research Institute, Los Angeles, accession no. 860679), which was sold with another Rothermere picture to Molyneux on the day of the Christie's sale. Nineteenth Century French Paintings, National Gallery, London, 1942, no. 68,as La Plage à Deauville. French Paintings from the Molyneux Collection, National Gallery of Art, Washington, D.C.; Museum of Modern Art, New York, 1952, unnumbered checklist [according to Small French Paintings (1978)]. French Paintings from the Collections of Mr. and Mrs. Paul Mellon and Mrs. Mellon Bruce, National Gallery of Art, Washington, 1966, no. 16, repro. Französische Impressionisten und ihre Wegbereiter aus der National Gallery of Art, Washington und dem Cincinnati Art Museum, Neue Pinakothek, Munich, 1990, no. 30, repro. From El Greco to Cézanne: Masterpieces of European Painting from the National Gallery of Art, Washington, and The Metroplitan Museum of Art, New York, National Gallery of Greece, Athens, 1992-1993, no. 44, repro. Masterpieces from the National Gallery of Art, Washington, Kyoto Municipal Museum of Art; Tokyo Metropolitan Art Museum, 1999, no. 11, repro. Loan to display with permanent collection, Academy Art Museum, Easton, Maryland, 2009-2010, no catalogue. Small French Paintings from the Bequest of Ailsa Mellon Bruce. Exh. cat. National Gallery of Art, Washington, D.C., 1978: 6, repro. (continuing exhibition beginning in 1978). Walker, John. National Gallery of Art, Washington. Rev. ed. New York, 1984: 443, no. 634, color repro. Französische Impressionisten und ihre Wegbereiter aus der National Gallery of Art, Washington und dem Cincinnati Art Museum, Exh. cat. Neue Pinakothek, Munich, 1990: no. 30, repro. Kopper, Philip. America's National Gallery of Art: A Gift to the Nation. New York, 1991: 260, color repro.